#271. 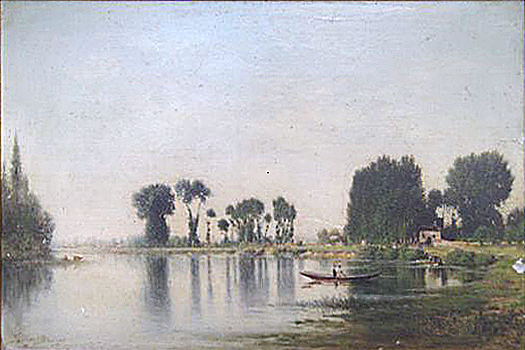 The Seine at Bougeval. 12 x 18, oil on mahogany panel. "Gilbert Munger" lower left. This painting depicts the same scene as #244 and #287. See the latter for a discussion of a 1910 auction that may include this painting. A materials supplier stamp on the back of the panel reads: "E. MARY & FILS / 26 RUE CHAPTAL PARIS." A hand written sticker on back reads: "No. 4. The Seine at Bougival, / Paris 1889 / Gilbert Munger." 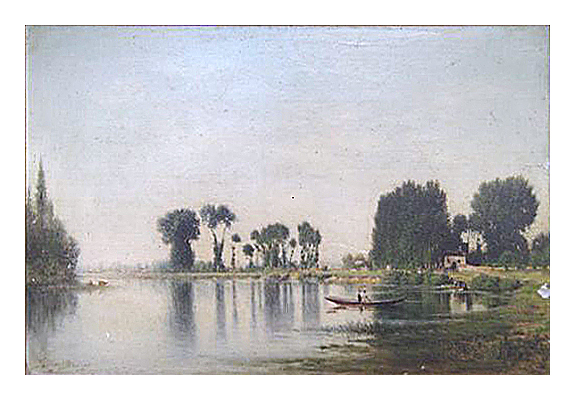 The painting was reported in an email from a correspondent who's mother inherited it from an aunt. Image from an email sent by the owner's son.